A look from Adam Andrascik’s Fall 2015 collection for Laroche. Photo: Yannis Vlamos. Image: Vogue.com. From Guy Laroche to Paco Peralta, Vogue’s designer patterns for Winter/Holiday 2017 offer a range of festive looks for the coming season. The ensemble is the first pattern to be drawn from Adam Andrascik’s debut collection for Laroche. V1573 by Adam Andrascik for Guy Laroche on the Fall 2015 runway. Photo: Yannis Vlamos. Image: Vogue.com. 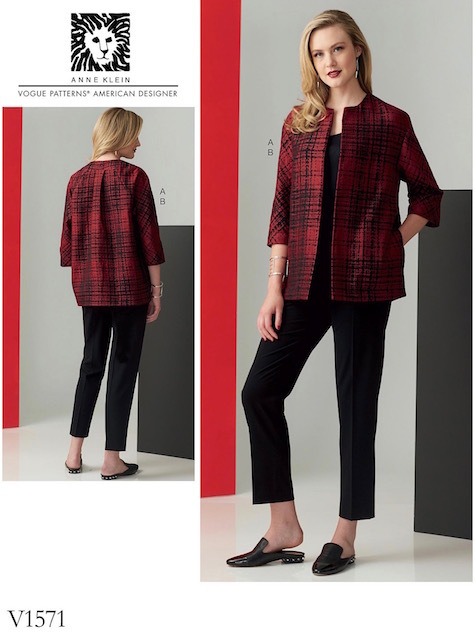 Vogue 1571 by Sharon Lombardo for Anne Klein (2017) Image: McCall’s. Vogue 1566 by Zandra Rhodes (2017) Image: McCall’s. Zandra Rhodes’ Songket dress, FW 2016. Photo: Andrew Woffinden. Editor: Grace Woodward. Image: Zandra Rhodes. Vogue chose three of Rhodes’ Songket pieces—a dress, peplum top, and trousers—for the Winter/Holiday collection. Songket is a traditional metallic brocade produced in Southeast Asia. Vogue 1572 by Zandra Rhodes (2017) Image: McCall’s. Zandra Rhodes’ Songket top, FW 2016. Photo: Andrew Woffinden. Editor: Grace Woodward. Image: Zandra Rhodes. Zandra Rhodes’ Songket trousers, FW 2016. Photo: Andrew Woffinden. Editor: Grace Woodward. Image: Zandra Rhodes. Vogue 1567 by Paco Peralta (2017) Image: McCall’s. I have some Lurex in my stash, don’t you? If you’re fresh out of shiny fabric, you might be interested in Gorgeous Fabrics’ farewell sale. Last weekend, owner Ann Steeves announced that she is closing shop after 11 years in business. Amanda Murphy wears Laroche by Adam Andrascik, Miss Vogue supplement, Vogue Paris, September 2015. Photo: Lachlan Bailey. Editor: Géraldine Saglio. Image: Guy Laroche. The Guy Laroche and the Paco Peralta are my two favourites from this release. I doubt I’ll make the Guy Laroche blouse but the trousers look very appealing. The Zandra Rhodes textile reminded me of Vivienne Westwood’s squiggle print. The metallic dresses are my favourite!!! !